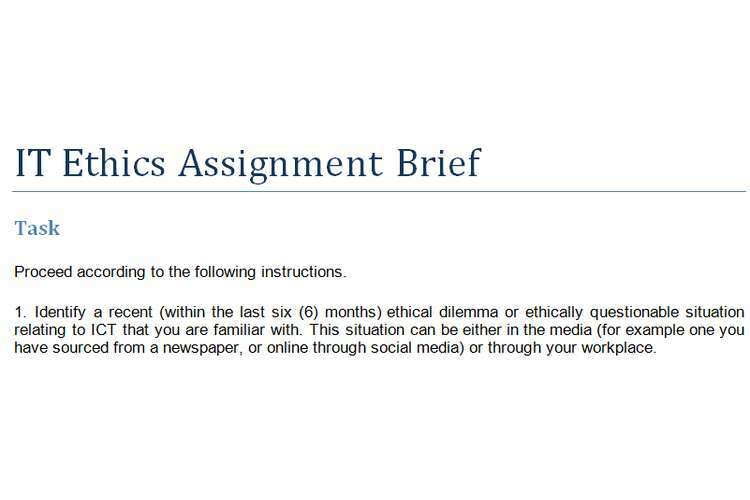 This IT ethics assignment brief is based on Doing Ethics Technique (DET) and ethical dilemma. Proceed according to the following instructions. 1. Identify a recent (within the last six (6) months) ethical dilemma or ethically questionable situation relating to ICT that you are familiar with. This situation can be either in the media (for example one you have sourced from a newspaper, or online through social media) or through your workplace. 2. Undertake further research about your chosen case to assist you in analysing and discussing it in your essay. 3. You are required to analyse the ethical dilemma you have identified above using the Doing Ethics Technique (DET). The word limit should be between 900-1000 words. Note: Headings, citations, references and any appendices do not count towards your word limit, but quotations do. At the start of the assignment indicates in brackets the word count of your assignment excluding those items mentioned above. 4. Include a Reference list at the end of your work, in the correct APA referencing style, corresponding to in-text citations. You must include at least TWO (2) quality academic references from different sources. Please note that these references are in addition to those provided to you through this subject (for example, you still must reference, the DET, Tavani, the Interact subject lecture notes etc BUT these references cannot be used as one of your two quality academic references from different sources). Only include references that have been cited in the body of your assignment and ones that support what you have presented in your assignment.